The final race in the 2011 NASCAR Canadian Tire Series tour, the top stock car racing arrives at the 0.375-mile Kawartha Speedway short oval prepared to turn a 250-lap event into a final stand for this season. Each vying for a second NASCAR Canadian Tire Series championship, DJ Kennington was trailing Scott Steckly for the top spot in the standings. Taking pole for the Saturday evening Kawartha 250, rookie driver Steven Mathews blitzed the track in 17.737 seconds. Despite the opportune top spot in the 26-car grid, Mathews' #15 Ford Fusion was immediately battered by the more race-seasoned JR Fitzpatrick. Through the early going of the Kawartha 250, the race featured Canada's most promising 'Young Gun' drivers. Behind Fitzpatrick and Mathews, Peter Shepherd in the #7 Dodge was also a presence at the front early hoping to repeat his upset victory in last year's finale. Starting 10th, it took DJ Kennington a very short time to work his #17 Castrol Dodge Challenger into the top-5. By lap 52, Kennington sailed around Shepherd for 3rd place and would work his way into the lead of the event by lap 69. Hoping to net a significant points gain for this final event, DJ Kennington's best efforts would be only half of the equation for repeating as NASCAR Canadian Tire Series champion in 2011. The #22 Canadian Tire Dodge piloted by Scott Steckly had to suffer troubles in the event in order to alter the overall series point positions. Through the Kawartha 250, Steckly's Dodge was on even pace with Kennington as they both angled into the top-5. Being the final race on the 2011 schedule, the event left many drivers and teams eager to prove themselves aware that the next season is around 7 months away. Patience and tempers ran short in this season finale for the NASCAR Canadian Tire Series with 13 cautions for 89 laps telling the story. Under the 8th caution, Steven Mathews (who fought his way to lead 27 laps of his pole-sitting race) became a victim when his #15 Ford was spun out coming to a restart. Eventually coming home in 7th place, Mathews would be the highest finishing rookie in the event. Unfortunately for Steven Mathews' once-promising rookie of the year contention early in the season, a set of race the #15 team missed midway through the NASCAR Canadian Tire Series season cost the 21-year old valuable points. JR Fitzpatrick's #84 Chevrolet looked extremely good for breaking into the winner's circle for 2011 season leading 70 of the Kawartha race's 250 laps. Unfortunately, Fitzpatrick and team were served a penalty during the event which had the #84 car down a lap. Rallying back to a strong lead lap finish, JR Fitzpatrick claimed 3rd in the Kawartha 250 as well as 3rd in the points championship after a difficult season. Fitzpatrick's third spot in points does allow the Cambridge, Ontario native to prevail over fierce rival Kerry Micks. The duo reignited a feud at Barrie Speedway that led from a last lap incident where Fitzpatrick was punted by Mick's #02 Ford. In the late stages of the Kawartha 250, it was the #17 Dodge that was the dominate machine on track. Unseating Peter Shepherd from a 27-lap reign at the front, Kennington took over the lead on lap 167 and proceeded to lead convincing up to the checkered flag. Fending off a challenge from JR Fitzpatrick and Scott Steckly under a green/white/checkered finish, the Castrol Dodge team with driver DJ Kennington celebrated their 2nd season win in the 2011 NASCAR Canadian Tire Series. Despite Kennington winning the Kawartha 250 and leading the most laps with 108 circuits, a solid second place run allowed Scott Steckly to take a second NASCAR Canadian Tire Series championship. After the final race, Steckly won with a comfortable 59-point gap over DJ Kennington. 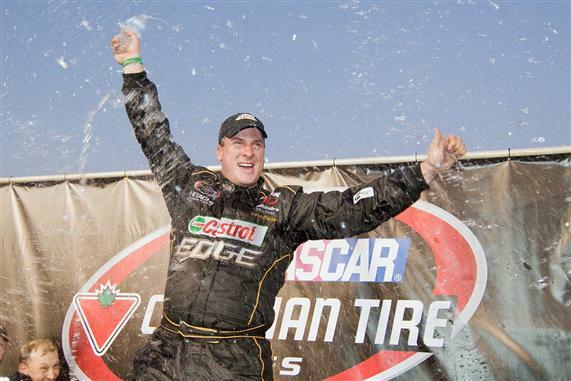 Winning the title in 2008, Scott Steckly joins Andrew Ranger as a two-time NASCAR Canadian Tire Series champion since formation in 2007.